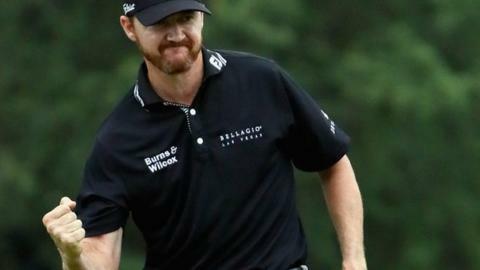 American Jimmy Walker won his first major with a one-shot victory at the US PGA Championship at Baltusrol. The 37-year-old closed with a bogey-free three-under-par 67 to hold off Australia's world number one Jason Day (67) and win on 14 under. American Daniel Summerhays (66) was third on 10 under, while Open champion Henrik Stenson faded with a 71 to finish joint seventh on eight under. "It is surreal, an incredible finish," said Walker, ranked 48th in the world. England's Tyrrell Hatton (68) and Paul Casey (67) ended on seven under. For the first time since 2011, all four of the year's majors have been claimed by first-time winners. England's Danny Willett won the Masters in April, American Dustin Johnson took the US Open in June, while Swede Stenson won the Open two weeks ago. He opened his week with a five-under 65 to lead the tournament and followed it with a 66 to hold the halfway lead on nine under with American Robert Streb. Walker did not play on Saturday, when the threat of storms forced play to be abandoned, but returned with 49 others on Sunday morning for round three. He carded a 68 to take a one-shot lead over defending champion Day, who had shot a 67, into the afternoon's final round. Walker holed half-a-dozen putts of between three and five feet as he opened with nine straight pars to reach the turn on 11 under. He then pitched in from a bunker on the 10th for a birdie and followed that with a 30-foot putt on the next to get to 13 under. A run of five pars was ended by a third birdie on the par-five 17th, but it turned out to be a more nervy finish than Walker would have hoped for. With a three-shot lead on the last, he opted for the safety of an iron off the tee. But then Day rolled in a 14-foot eagle putt to close the deficit to one and Walker then hit his second shot into greenside rough. He chipped his third to 35 feet and had two putts for the win, eventually holing from three feet to seal the title. "I made it a little more difficult than I would have liked but I did it," said Walker. Defending champion Day and Stenson, who had earlier posted a third successive 67 in round three to reach nine under, were both within one shot of Walker during the final round but neither were able to catch the American. Two bogeys in his opening three holes meant Day dropped back to eight under but he holed three birdies in seven holes from the fifth to get to 11 under. Although he finished with an eagle, the six pars that preceded it proved costly. "The eagle was nice," said Day. "I had to step up and do something and I hit two good shots with my two-iron. "I wanted to give Jimmy something to think about but it wasn't quite enough." Stenson looked the more likely to challenge after a birdie on the sixth got him to 10 under, but, like many, he struggled with the pace of rain-soaked greens. He then sent his approach to the 15th over the back of the green and looked a beaten man after fluffing a chip and carding a double-bogey six. He finished tied with Martin Kaymer as the top European after the German eagled the par-five 18th to close with a four-under-par 66 and eight under total. England's Justin Rose (68) and Scotland's Russell Knox (69) both finished on four under for the championship. Ross Fisher's 69 moved him up to two under, alongside Welshman Jamie Donaldson (70) and one ahead of fellow Englishmen Matthew Fitzpatrick (67) and Andy Sullivan (69). Andrew Johnston delighted his new-found fans with a birdie on the last to finish with a one-over 71 to finish one over par. Masters champion Danny Willett closed with a level-par 70 to finish five over, as did Wales' Bradley Dredge, while England's Lee Westwood finished with a double-bogey seven on the last in a round of 75 to finish seven over.